With a billiards table, fitness area, an outdoor covered terrace, a heated swimming pool, and nearby tennis courts, this property is great for couples or a family with older children looking for a variety of options. Casa del Mar is luxurious and private, with a stylish gazebo overlooking the sea. Your family will love exploring the natural pools along the coast, and there’s more than enough space to relax and recline across the villa. Casa del Mar Villa is located on the hillside in Domaine du Levant with a view of the cliff and ocean. Domaine du Levant is an exclusive residential community located along Petit Cul de Sac Bay. The property has two swimming pools, and a Jacuzzi that overlooks the sea. Several loungers surround the pool, and more seating can be found under the covered porch right outside the villa. The spacious dining pavilion overlooks the rest of the property, separated from the rest of the deck. A gas BBQ grill makes al fresco feasts easy. Guests can also dine on the covered pavilion next to the pool, or enjoy a game at the billiard table on the lower level. The beach and tennis courts are also on the lower level of the deck. The fitness room is located in the basement, with a treadmill, rowing machine, exercise bicycle, stepper, weights, and fitness bench. 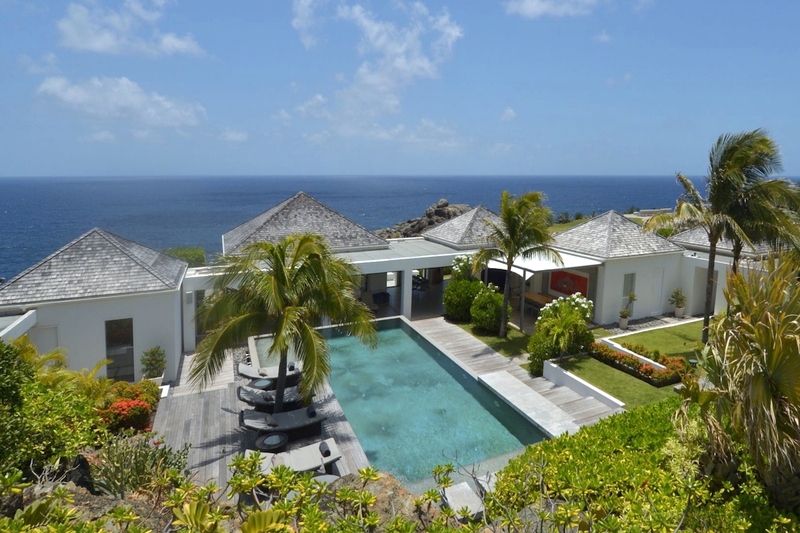 The main villa holds the gourmet kitchen and breakfast bar, the media room, lounge areas, and four ensuite bedrooms with king size beds and ocean view. The living pavilion features multiple sitting areas and window seats that look out at the view. The media room has a projector screen and deep leather sofa, and can be found on the lower level of the main villa. The fully equipped kitchen has an electric oven and stove, microwave, fridge and freezer, dishwasher, kettle, professional steamer, deep fryer, electric BBQ, kitchen knives, hood, toaster, coffee machine, and blender. A breakfast table for two by the window enjoys a view of the cliff and ocean. Each of the four bedrooms have king-sized beds, ensuite baths, satellite TV, DVD players, and ocean views. The guest house features a full kitchen, a living area, a pool, and two ensuite bedrooms with king-sized beds. Petit Cul de Sac Beach and Grand Cul de Sac Beach are nearby, while several restaurants are within a 10 minute drive. Gustavia is a 20 minute drive away, where guests can find duty-free shopping and global dining. For adventurers, natural pools are accessible via a path along the cliffside. Not advised for young children. Bedrooms are located in separate pavilions.